When it comes to magical-realist Craigslist finds, it’s hard to beat the commonwealth of Virginia. The state that so memorably bestowed El Dordo on us has now introduced us to a man (we’re assuming it’s a man) who can only be referred to as the Baron of LeBaron. 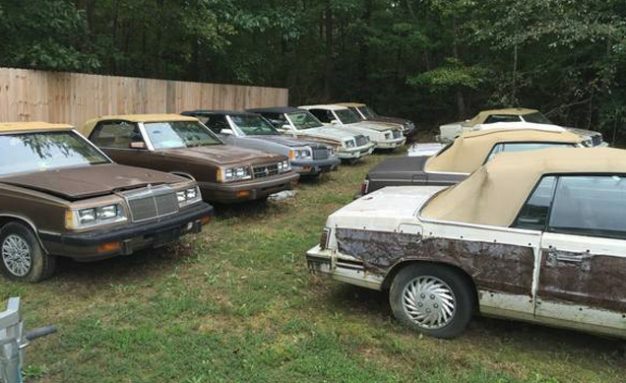 He’s got 22 of Chrysler‘s K-cars. And he’s dealin’ on all of ’em. Strongly consider the re-enactment possibilities: Find yourself a girl with a short skirt and a long jacket. Dress up your favorite frenemy as John Candy and explore intermodal transportation together. Get Jon Voight’s digits from Angelina and take him out for burgers and a box of Ticonderoga No. 2s. Sell the car to him for 30 cents when you’re done. You’ll still have 21 of the things left if you buy the Baron’s entire stock! In the name of authenticity, however, we must note that the LeBaron in To Catch a Yeti was a vinyl-roof model, while the Baron’s LeBarons (“some are Town & Country,” he helpfully notes) all are convertibles. Still, we’d call that a feature. After all, when you’re profiling in the George Costanza way, won’t you want the world to gaze upon the glory of your effortless style?